If you have concrete floors in your basement you can reduce your electricity bill and make your basement more inviting by installing heated concrete floors. According to the laws of physics heat moves up, so when your basement floors produce heat, this energy moves up keeping your entire home warmer. It is becoming increasingly popular for homeowners to install heated concrete basement floors in Toronto. A number of materials can be used with radiant-floor heating, but concrete is one of the most efficient materials for the job. The best part is that polished concrete can be made to imitate the look of many other more classic interior flooring materials, offering an affordable high-end look that is also warm and cozy. How Does Radiant-Floor Heating Work? The science behind heated concrete basement floors is not all that complicated. In simplicity it works just like the Earth, the sun heats the surface of the Earth, which then radiates this heat back up and out—hence why it’s so dang hot in the desert despite how far from the sun you really are. Radiant-floor heating works the same way, by literally radiating heat from the ground up. There are two common forms of radiant-floor heating systems: electrical and hydronic. Electrical heated floors are generated through electric wires placed beneath the floor’s surface. Electric radiant flooring is less labor-intensive to install but more expensive to operate on a regular bases. Hydronic heated floors are generated through hot water tubes placed beneath the floor. Hydronic radiant-floor heating systems are more labor intensive to install but more affordable to operate. The added labor and installation costs are especially worth it if you are placing throughout a large area. Can You Add Heated Basement Floors To Pre-Existing Flooring? Yes, you sure can! 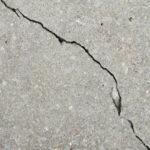 Even if you already have a concrete floor and you don’t want to rip it up and replace it, you still have options. 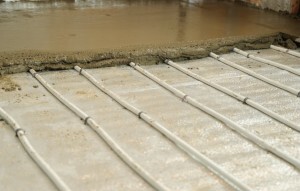 There are ultra-thin electric heating mats you can embed within the cement or gypsum overlays. As a result, this retrofits the existing slabs without the need to drastically raise floor height. 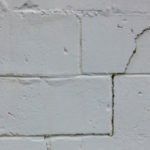 In other words, you create a second skin over your preexisting concrete floors to cover the additional of heated coils. 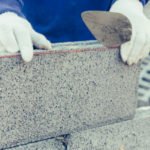 Basement remodels are incredibly common, in fact the popularity of remodeling basements comes in just behind kitchen and bathroom remodels. Remodeling your basement gives you an extra space in your home to hang out, and it also increases home value. One of the largest drawbacks to any basement is the chill that permits, and this chill starts from the ground up. By adding heated floors you turn a cold basement into a warm and inviting space. 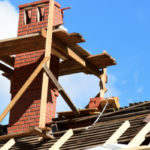 Traditional heating and cooling systems are not as effective, here’s why: when the heat is poured out through vents it rises up and then drops back down at a lesser temperature. When the heat starts at the ground level it rises up with the same level of heat. Also, when your feet are warm your entire body temperature naturally stays warmer, even if the actual indoor temperatures are lower. Installing a heated concrete floor in a pre-existing basement is more work than starting from scratch. If you are building a home from the ground up it is highly recommended to consider heated basement floors because installation is just another component of the building process, yet offers many benefits. Polished concrete looks nothing like the plain and industrial material you know as traditional concrete. There are endless options for polished concrete floors that look like something else entirely, including non-toxic materials. These styles can imitate the look of tile and other traditional flooring, or be made to look completely unique. Is Your Basement Fit For Heated Concrete Floors? Before treating basement floors the most important thing to check for is water retention. Moisture can be high in below grade basement locations, which is why it’s important to run tests before starting any work. Moisture levels should be tested over a period of several days. If there is high level of moisture this will have to be taken care of and reduced before moving forward. Re-routing downspouts so that they are further from the outside perimeter of your home. Create a slope around your property so that water flows away from the structure. Run a dehumidifier in the room. If you are considering installing heated concrete floors to your Toronto basement contact Turnbull Masonry for a competitive quote today!